From a promo for Profitable Sunrise. Although the court docket in Williams County, Ohio, indicates that a settlement has been reached in a July 2013 civil case brought against Profitable Sunrise figure Nancy Jo Frazer and others, the office of Ohio Attorney General Mike DeWine said this afternoon that there was nothing to announce immediately. She added that “further updates” could be forthcoming. With no final settlement document available, it remains unclear if any fines, restitution or disgorgement were ordered or whether there was any finding or acknowledgement of fault. The SEC described Novak as a possible ghost who was targeting Christians in a cross-border securities-fraud scheme that used a “mail drop” in England. “Profitable Sunrise operates for the benefit of unknown individuals and/or organizations doing businesses through companies formed in the Czech Republic and using bank accounts in the Czech Republic, Hungary, Latvia, and China, among other places,” the SEC alleged in April 2013. 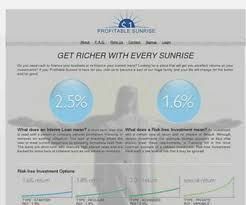 Like many other fraud schemes, Profitable Sunrise was a Ponzi-board “program.” Its asserted “Long Haul” plan purported to provide a daily interest rate of 2.7 percent, plus compounding. It will be interesting to see if the judge agrees to the terms of the plea deal. I am sure the ruling and the terms will be fascinating reading. Just disappointed this didn’t make it to trial. Her followers will claim she was railroaded into the plea deal (just like Paul Burks followers claimed about his plea deal) and will try to make her out to be a martyr. Of course it is possible the Feds could step in and file criminal charges against her. I am sure that will be decided by the terms of her plea agreement with the Ohio AG.